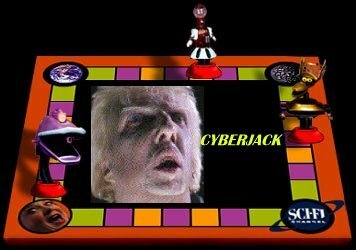 Cyberjack: it's very name hints at the intense, technology-based action it harbors. The crowning glory of this film is easily Brion James' trendsetting role as some palefaced evil guy that uh, does things and ummm... there's a virus. Oh yeah! And Michael "American Ninja" Dudikoff shows up once in a while and does other things that are central to the memorable plot. You see, he's this heroic virus-hating, albino-bashing janitor or something. Memories of this experiment are marked by (for me, anyway) intense, throbbing molar pain. Watch for Warwick Davis as CYCLOPS the friendly, wisecracking cop-droid. KevinL> So, is CyberJack gonna be anything like Freejack or Billy Jack? Trainman> "COPS" is filmed on location with the police of the future. Balthasar> Nice gun. I see you bought the Special edition of Lethal Enforcers for the PC too. bowleg2> The future is now. Learn to apply Adobe Premiere filters. Jawz> "Oh, everyone is talking about the internet-whatscha mahootziethingy on the news. Isn't it neat? KevinL> Retinal identity scans. This thing gets more and more futurey every minute. bowleg2> So, "Cyberjack". I'm starting to think there might be some basic design flaws in this movie. Trainman> It's the future...doesn't he mean "10,000 credits" or something? THX-1138> Don't be a janitor because you just might have to save the day. KevinL> Giant, futurey font. Who woulda guessed? Q> i feel such suspense - will she be able to concentrate on her codes with a full bladder? Trainman> Cyberjacking? There hasn't even been apple jacking. Balthasar> Janitor vs. the Terrorist, Elevator Death Match! THX-1138> Mr. Janitor. You have a nasty habit of surviving. KevinL> Wow, crazy door. The futureyness of CyberJack continues to astound. Trainman> Fortunately, C.Y.C.L.O.P.S. can only move about 1000 feet per hour. Jamie> Billy Idol IS Christopher Lloyd! THX-1138> Putting the sirens on the back of the car where it can't be seen = futuristic. bowleg2> The acting is coming from inside the house! bowleg2> Anyone want to take a stab at what CYCLOPS stands for? bowleg2> Cybernetic Yardstick Contustion & Laceration Omniscient Pudding Squad? KevinL> Consider Yourself inCarcerated, Loser Outlaw Punk Scum! Balthasar> Why, as a janitor, would you shoot people in the hallway knowing you have to clean it all up? THX-1138> Death is but a doorway, time is but a window. I'll be back. "Would you like to visit our virtual reality lab?" "This is a lab. Not a goldarn sideshow!" "Want me to change a lightbulb? I'll change a lightbulb. Fine." "Are these women making sense to you?" "Do you have an image in your mind, Doctor?" "Risk... is a stepchild of Ambition..."
"Get that piece of slime outta here!" "Failure... is encoded in your DNA!"